This is a review of Darkmoor Dungeon. Darkmoor Dungeon is a rather old game, made by Moogle1, who goes by Mogri nowadays. It tells the epic story of a bunch of dudes fighting some other dudes. This game is about boss battles, and nothing but. You create a party of four character (in my case, Paladin, Witch, Priest, and Wizard), and start in a dungeon. Your goal is to get out, but there are "battle orbs" blocking your way. Fighting them opens up new paths, and lets you go on to fight new, bossier bosses. You can get items to use, but the only equipment options in the game drop from optional bossier bosses in the second-to-last room, which is a little disappointing. Some of these battles are really clever and creative, and show off the potential of the OHR engine really well. Examples include the shroud mage, who can only be hurt by killing a certain one of his minions, which then respawned (It took me a minute to figure out how Moogle1/Mogri did this), and a boss that started with six monsters that insta-killed you, and summoned more, but who somehow wasn't incredibly frustrating. The graphics are nice, but there's not much to say about them besides that. They're honestly a bit repetitive. At an hour (not counting many deaths...), this game's rather short, but I consider that a good thing, as it doesn't wear thin. Some battles...less good. In the above picture, for instance, the boss will occasionally hide, and attacking one of the three holes instakills whoever attacked. It's my wizard's turn, I have no non-attack options, and I can't pass. I lost that go round. In the rematch, the boss never hid, making the battle really easy. Other bad battles include the (recurring!) Cleric Sisters. One revives the other two if there's only one left. You can't spread out your damage, though, because the sisters can heal faster than my party can hurt. The Vengenace boss will occasioanlly use an attack that deals damage equal to what he received since the last time he used it. This requires you to be very careful about when you attack, in theory. In practice, I just spammed safe and regen to make my Paladin invincible, then put some quarters on my enter key for a while. The Basilisk battle was also pretty bad (albeit option), because if they started by petrigassing my Paladin, I'd basically lost. They were the last boss I faced before the disappointingly easy final boss, against which the weapon they dropped was useless. Whoo. I also didn't like the lack of variety in going into battles. I would've liked equipment to drop earlier. The Magic Shield greatly increased my strategy options, because I had 3 people who could make great use of it, but I didn't get it until way too late in the game. The dialouge is kind of meh, but this game wasn't marketing for its gripping story, so eh. Darkmoor Dungeon did things with the OHR that were, at the time, new and inventive. Unfortunately, it lacks polish, and leads to a gameplay experience that's often more frustrating than fun. Hold down Alt or Esc. This is in one of the readmes. Potion3 works in the most recent version, which also has sounds and battle anims, so I'm pretty sure you have an old version on your hands. Is that the one available here? I agree that the Basilisks are unbalanced (and probably the second-hardest battle in the game, behind the bad ending last boss), although they were a post-release addition and unnecessary to get the good ending. Out of curiosity, did you get the good ending? I should really learn how to play games before I review them. Huh. I got it off Castle Paradox. It was noted as being "the final version". No, but I actually found the bad ending last boss really easy (Poison2), though it would've been ludicrous if I didn't have a witch. I imagine getting the good ending requires me to not use items and/or beat the final boss with a Wrath-G, or the like? You use the Wrath-G on the last boss, which leads to another last boss. I don't remember if I kept the Castle Paradox file up-to-date. There's a changelog on both entries, though. The reason CP notes that it's the final version is because the only other option is that it's a demo (or "in development," or something like that). I've updated DD a few times since its initial release, though it's generally been minor stuff. The attack graphics and sounds were the biggest change, unless you consider bugfixes to be bigger. Yeah, I figured as much. I'm a little curious as to how you did that, though maybe you shouldn't explain a spoiler in a thread. Lots and lots of elemental spawning. That's how the cleric sisters "revive" each other as well, right? Yeah, most of the enemies use elemental spawning to some degree. The last boss uses all eight elementals for spawning in one form or another. Moogle, any chance you might change the name of Phantom Tactics to Darkmoor Beckons? Because it seems that a.) a world map tactical engine like that found in Phantom Tactics would be the logical follow-up to a battle map tactical engine like that found in Darkmoor Dungeon, b.) you once said that "Phantom Tactics" was a temporary name until you came up with something better, and c.) it seems like you're procrastinating on Darkmoor Beckons's development more and more with each new game you start, and, well, some of us would like to see it someday, and d.) Darkmoor Beckons should technically be a game of incomparable quality and awesomeness and it seems you're trying to achieve that with Phantom Tactics. That's not so much a slight derail as a total threadjack, but okay. a) Yeah, I remember considering that. I think I ultimately decided against it, although more recently I've made better progress in similar engines. b) I did, and my wife hates the name, but honestly, I still got nothin'. c) True. I think there are two major reasons why DB keeps getting delayed, and they are related. One of them is that I sort of idolize DD, and I'm intimidated by the prospect of making a better game in the same style. The other is pretty much (d), and my perfectionism is getting in the way of my productivity. - Plotwise, PT doesn't fit into the framework established by the DD universe. Moreover, I already have most of the events in DB ironed out (and have had for years now), and they're incompatible with the existing elements of PT. - Gameplay-wise, PT doesn't feel anything like DD. Elements that I feel are important to have in a DD sequel include a fixed, selectable party (chosen at the outset of the game); uniqueness in battles (battles should not feel repetitive, and each battle should play differently from most other battles); limited character growth (meaning that their power level doesn't change much from the start of the game to the end); and multiple endings. PT features several of those, but not enough to feel like a true sequel. 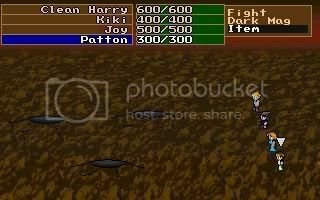 - Most importantly, affixing the "Darkmoor Beckons" label to a game doesn't make it Darkmoor Beckons. I'd rather keep you waiting and produce a true followup to DD than to force the name onto something I've already taken in another direction. I must admit that had the idea occurred to me early in the game's development, I would probably have jumped on it, but at this point, there's too much I'd have to undo. Bug me about DB some more once I'm finished with PT. I do mean to come back to it at some point. That's a defining feature of Darkmoor Dungeon to you? Because you used Aigis in multiple battles, and did the Cleric Sisters twice. The first floor is warmup! The first battle (Ogre + Wizrobe x2) is 100% "get used to your characters," and the second is pretty much the same. So, throw those out. The concept battles don't really start until you get to Earthwyrm. The actual Aegis enemy appears in two or three battles that I can remember, and the tri-Aegis battle plays much differently from any of the others the Aegis appears in (and is the only Aegis battle to offer any challenge). Cleric Sisters II plays slightly differently from Cleric Sisters I (Mag Res makes it a significantly harder battle for most parties), but you're right about that one. Also, I did say "most other battles," not "every other battle."